This is a new cutting edge therapy copper bracelet that 4 wonderful things going for it, so we call it 4 in 1. This solid copper magnetic therapy bracelet is grand in size at about 1/2" wide and is styled in burnished copper. It also has a stainless steel magnet cap for added durability. This style has 1) a 3000 gauss bio north facing magnet(silver), 2) Germanium(Black), 3) , Far Infrared Ray technology(Red), and 4) Negative Ion technology(white). 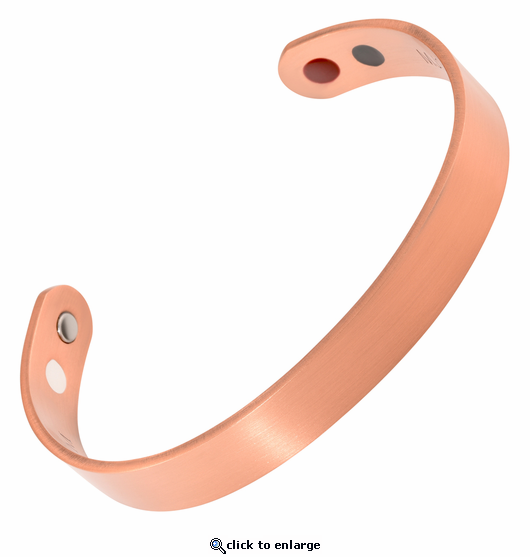 We hope you will enjoy this wonderful bracelet that combines 4 technologies that are believed by many to help our bodies naturally in many different ways.